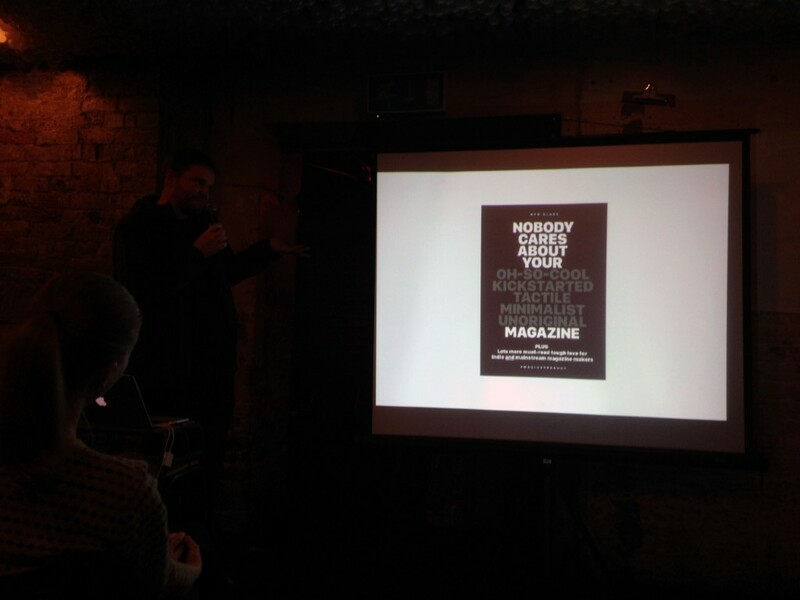 Back in January I attended my first Printout talk after seeing a tweet from Stack Magazines. Sorry that it’s taken me this long to get around to posting about it (oops) but after attending another Printout talk (which I’m posting on Wednesday, so check back!) I thought it was about time I got my act together. Sara & I headed to The Book Club in Shoreditch where whilst queuing, we were pleasantly surprised to be recognised by one of my blog readers, Crystal and her friend Charlotte. 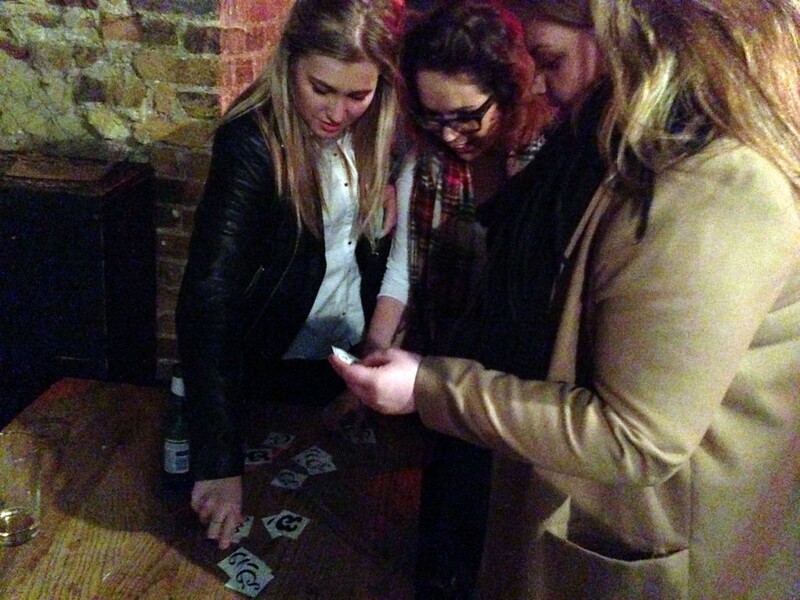 It was lovely to meet both girls and made the event even more exciting! 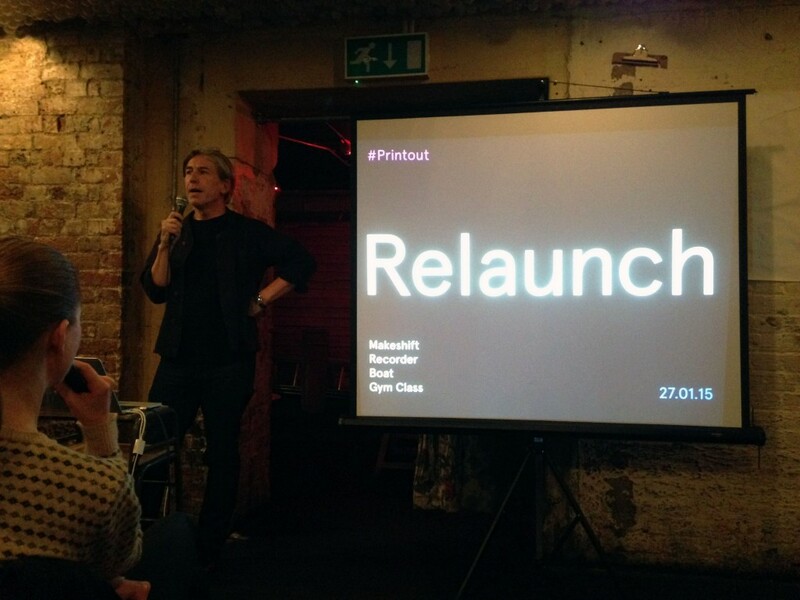 Hosted by Jeremy from MagCulture and Steve from Stack Magazines, the theme of the night was relaunch, with 4 magazines; Makeshift, The Recorder, Boat Magazine and Gym Class, all talking about their relaunch/redesign. As a magazine full of How tos, Makeshift is not meant to be sitting on a shelf and should be small in size so that it’s travel friendly. The new design is cleaner and takes inspiration from vintage signs, japanese labelling and vintage postcards, with the new navigator inspired by old train stations. The new redesign went right down to the small details too, and now Makeshift use a full stop version of their logo to sign off at the end article. The second speaker of the evening was Emma, editor of The Recorder. Being a 113 year old magazine from Monotype, Emma explained the barriers that she faced in the redesign of such an established magazine. Looking more like an academic journal, the redesign brought a radical change to the magazine, adopting a bold typographic style more inline with Novum, Upper&Lowercase and Gratuitous Type. Emma knew that the new design of The Recorder needed to push the boundaries of design and stand out against other magazines to gain a new, young audience whilst not alienating it’s existing fan base. No pressure, hey? Emma shared with us some feedback that she had received, which I can imagine would have been quite hard to read. I guess what you have to say here is that you can’t please everyone, and have to be very open to criticism when presenting a new concept. 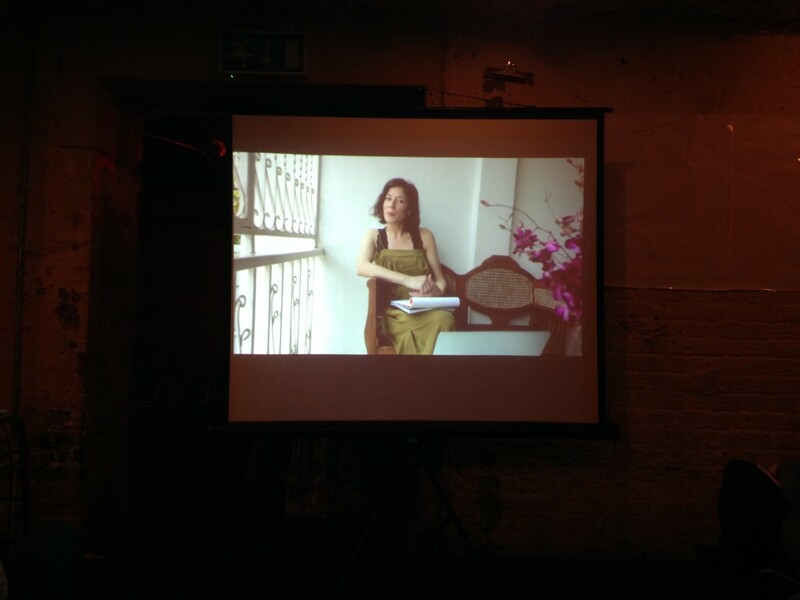 The third speaker joined us all the way from Bangkok… ok so she spoke to us via video. 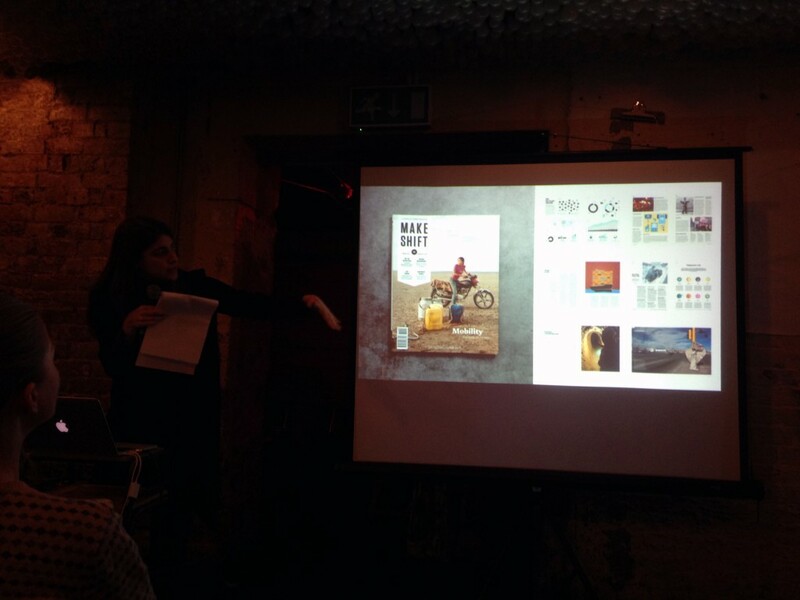 One half of the brains behind Boat Magazine, Elle, talked us through the reason and concept behind boat magazine. If you’re not familiar with Boat, listen up. Now on it’s 9th issue, working with locals to find interesting things about cities, Boat didn’t begin as a commercial venture. The plan wasn’t to produce a magazine to sell to the public. The husband and wife creative duo were experiencing a lul in business at their studio, and so decided to travel to a new place to experience, learn, gather information and turn it into a portfolio piece. 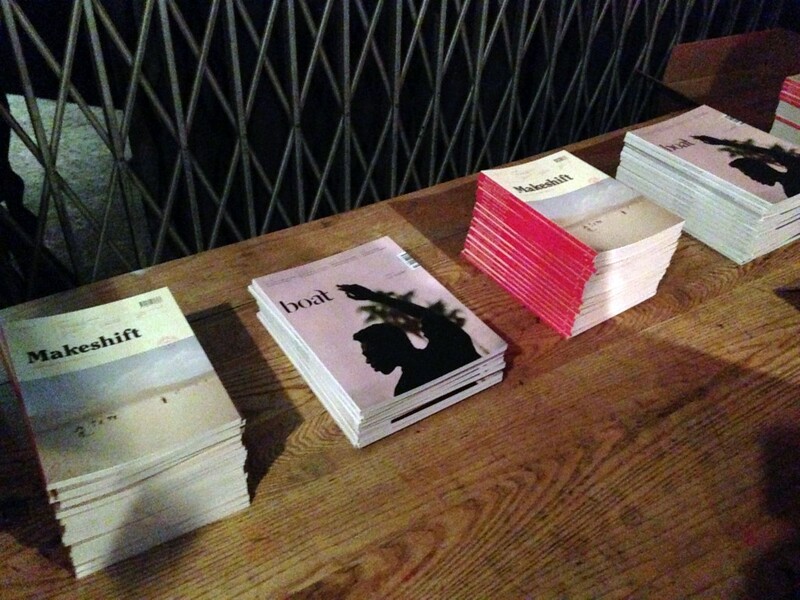 9 issues later and Boat magazine is still travelling the world. Each issue is focused on a different city, and the team have a hard task to make the magazine feel like each individual city whilst keeping the same thread through every issue. Elle explained that this is made possible with help from studio She Was Only, as aspects of the design are set, and some are flexible to allow the culture and personality of the city to shine through. For the redesign, Boat wanted to achieve a lighter journalistic feel, with typography showing the city via hand painted fonts from buses and signs. For each issue the team go to live in the city, sourcing local journalists, photographers, artists etc so that the stories are local and so can be honest and gritty. Boat Magazine is Lifestyle vs News – it’s a bit of grey area because it doesn’t really fit into just one area, but maybe that is why it works so well? The final speaker of the evening was Steven from Gym Class. A real character, he had the crowd laughing from the word go. Very down to earth and honest, he explained that he felt like Gym Class is basically relaunched and redesigned every issue because he is so indecisive. 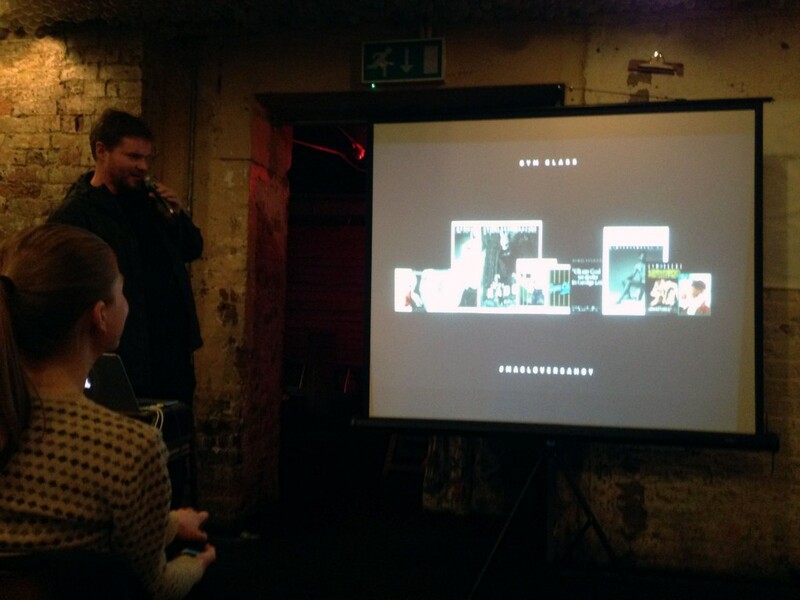 A magazine for magazine lovers (#magloversahoy), Gym Class began via instagram – where Steven had been posting photos for magazine cover junkies. He says: ‘Lots of people love magazines but nobody buys them’ and thought he might be on to something when a photo of Esquire got 157 instalikes. The 1st copy of Gym Class was litho printed, in 20 copies with 4 different covers. But Steven says it wasn’t really intended to be sold. He talked us through the ever changing format and sizes of Gym Class: A5 to A4 to A3 to A2 with a full spread of text – ‘I don’t think anyone ever read it’. – Newsweek = Do readers care about white space, whiter stock, a spot varnish cover? Do you have to think about money? The Recorder – a designers dream… basically no budget! Gym Class – investing his own money into magazine, and has managed to call in a lot of favours so far but wants to be able to pay everyone who contributes in the future. And what about learning from what went before? 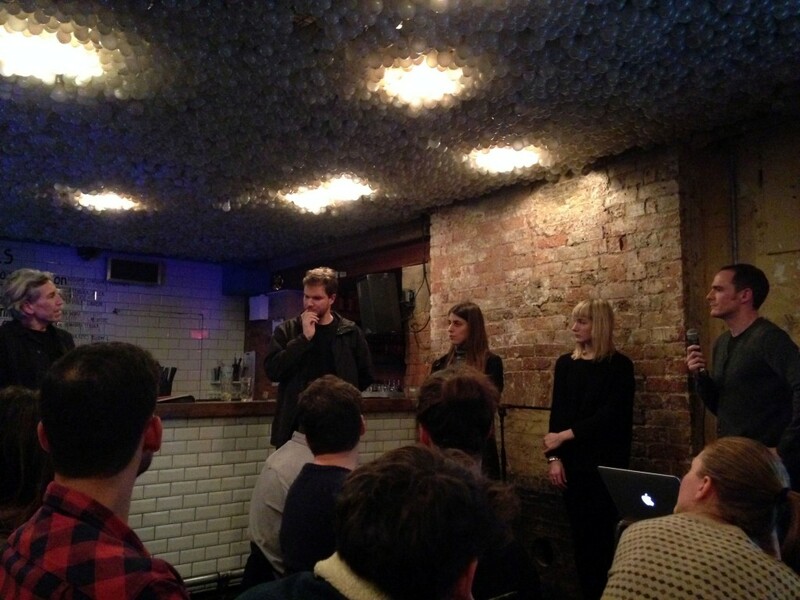 Makeshift – Crowd funded because we’re interested in stories that aren’t usually being printed. The profits are not big, but it’s worth it to get the stories heard/out there. What’s your take on tablet magazines? Gym Class – They are the dullest things to make! Do you have online content? Gym Class – Social Media has been/is really important for our awareness. My advice would be to use it properly! At the end of the talk Sara, Crystal, Charlotte and I were drawn to the temporary Ampersand tattoos by Monotype, whilst discussing magazines and the woes of being a design student. 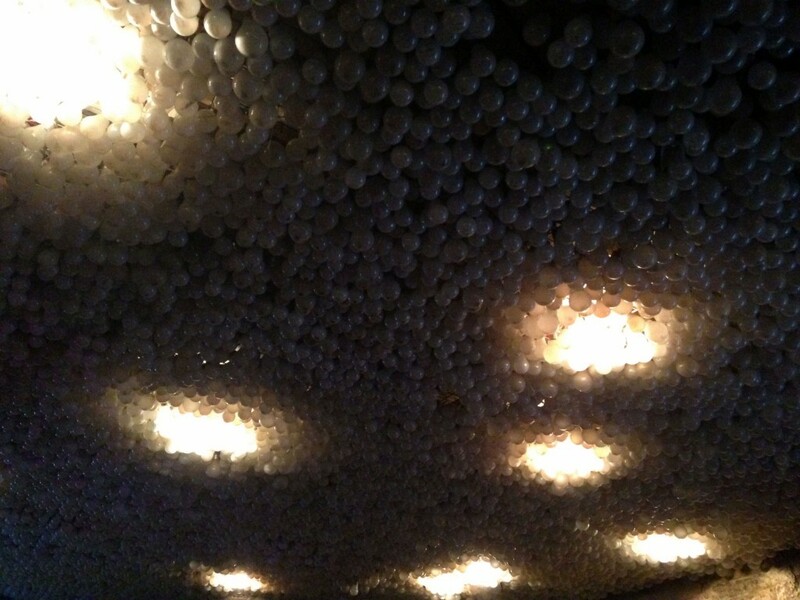 All in all, it was a pretty inspirational evening. 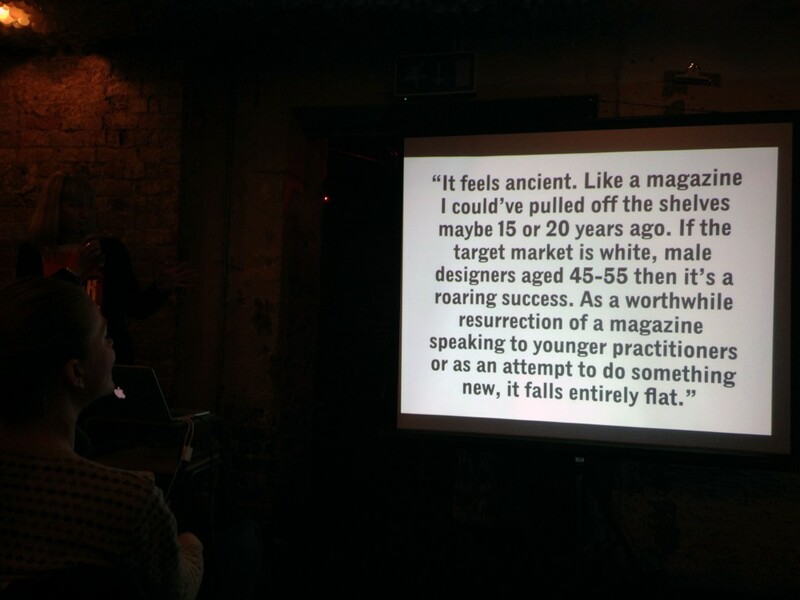 It really got me thinking about the future of magazines, print and the way in which design can affect the economy. 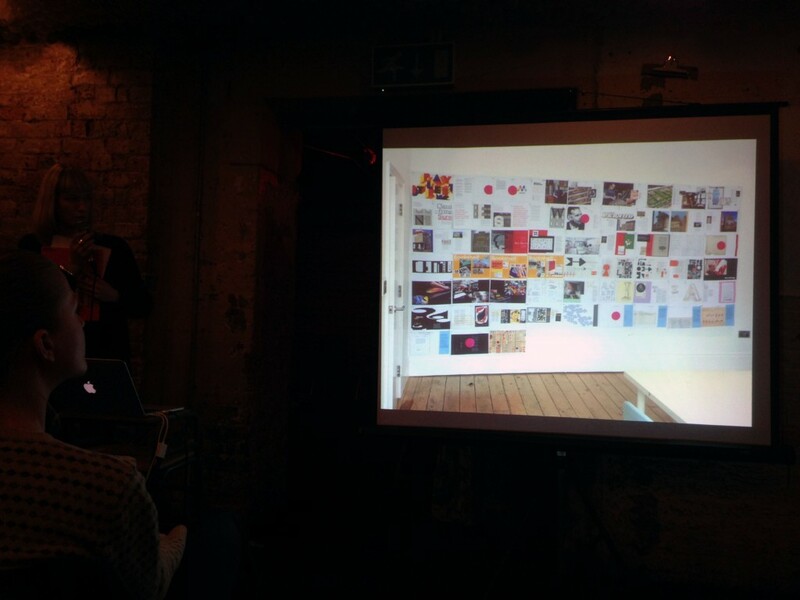 As I mentioned, I have attended another Printout talk since and the post will be going live on Wednesday lunchtime, so check back for more print fun! What did you think to the 4 magazines? Didn’t know about them before and now you’re in love with them? Let me know which is your favourite – I don’t know if I could pick, but I’m SO fascinated by the concept behind Boat magazine!